A striking bull's-eyeon Mars ? evidence of a massive Martian impact ? has been beamed to Earth fromthe high-powered camera onboard a powerful NASA spacecraft orbiting the redplanet. Scientistsare now trying to determine what could have caused the central pit within the Marsimpact crater. In other words, was it the product of unusual subsurface layering, or was it created by a fortuitoussecond impact? "Impactsinto layers of alternately strong and weak material ? for example, ice richversus non-ice-rich ? produce terracing such as that seen between the inner pitand the outer rim," ?wrote Sarah Milkovich, a member of the HiRISE scienceteam at the University of Arizona, in a statement. Previously,scientists have examined terraced craters in order to estimate the thickness oflavaflows on the moon and elsewhere, she explained. "Unevensublimation and periglacial erosion of exposed ice-richmaterial in theinterior of the crater may explain why the small central pit is slightly offsetfrom center relative to the terrace and rim of the larger crater,"Milkovich wrote. The pit inthe center of the main feature could also be explained by a later impact thatstruck inside and slightly off-center, she added.? "It hasa raised rim, which is characteristic of impactcraters and isdifficult to explain with a layered target," Milkovich explained. "While no ejecta from this later impact can be seen, the ejecta could havebeen removed by extensive periglacial modification. Additionally, the floorfill around the inner crater resembles impact ejects elsewhere at this latitude,and some of the 'landslides' to the East could be flow-back of ejecta off thewalls of the larger crater." 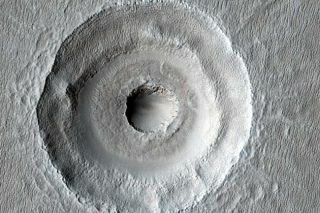 NASAreleased the photo recently, though the Mars Reconnaissance Orbiter actuallysnapped the bull's-eye crater on July 9, at 46.6 degrees latitude (centered) and 194.9 degreeslongitude (East) on the Martian surface.